Turkey's foreign ministry criticized the U.S.'s response to the secret deal between the PKK's Syria affiliate, the People's Protection Units (YPG) and Daesh to evacuate terrorists from Raqqa. "It is an extremely grave and eye-opening revelation that the so-called "Syrian Democratic Forces" dominated by PYD/YPG, brokered a deal with the terrorist organization Daesh to evacuate a large number of terrorists from Raqqa while the operation to clear Daesh from Raqqa was already underway," the statement read. 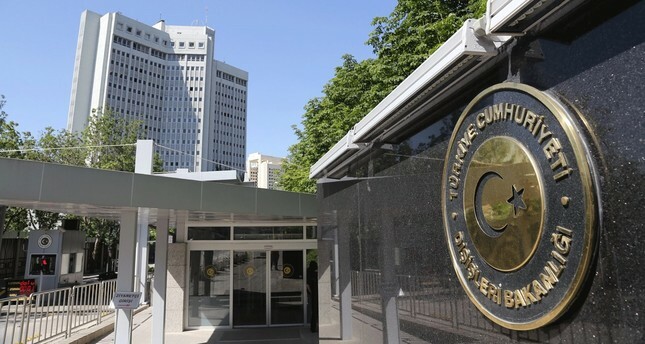 The foreign ministry said Turkey "deplores" the US-led coalition and U.S. Department of Defense's statements, in which they expressed their respect for the deal and called it a "local problem." "The deal sets a new example of the fact that fighting one terrorist organization with another would eventually result in these terrorist organizations colluding with each other." The BBC reported Monday that the deal was struck between Daesh and the SDF, a U.S.-backed force that consists largely of PKK-linked PYD terrorists. After speaking to many of those involved in the evacuation, the British broadcaster said a huge convoy consisting of around 50 trucks, 13 buses and more than 100 Daesh vehicles left Raqqa for Daesh-controlled territory to the southeast. The report said Daesh also withdrew at least 10 vehicles loaded with arms and ammunition and the fighters included foreigners alongside Iraqis and Syrians. On Tuesday, Turkish Prime Minister Binali Yıldırım slammed the U.S. for defending the deal. Yıldırım said, "Siding with a terrorist organization for demolishing another terrorist organization is not the kind of work which should be done by states. He pointed out the danger the escaped Daesh terrorists from Raqqa pose to the world. "Those Daesh members, who were freed with their weapons, will be able to cause the killing of innocent people, notably in Turkey, Europe and America," he said.